Far too often we find ourselves falling back on the same music habits, listening to old favorites instead of discovering new music. 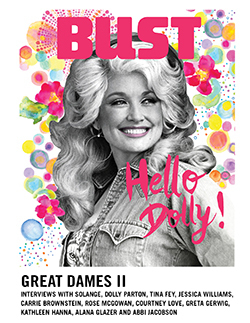 So we're bringing you BUST's album reviews from our December/January 2016 issue, featuring new music from Kate Bush, Miranda Lambert, Martha Wainwright and more — plus a playlist you can listen along to as you read! Brooklyn grunge trio Slothrust’s third LP, Everyone Else, muses on oceans and marine life. Sonically, the songs come in waves, most notably on “Pigpen,” which starts off soft but erupts into loud, explosive riffs midway through the track. Lead singer Leah Wellbaum’s writing is strong and full of metaphor; she compares herself to sea animals (“Horseshoe Crab”) and gourds (“Rotten Pumpkin”) without seeming trivial. “Sleep Eater” and “Trial & Error” showcase the jazz-punk fusion for which the band is known. It’s just another way that Everyone Else stands out, making the two-year wait for this album worth every minute.